Lancor Lumina in Guduvancheri, Chennai South by Lancor Holdings Limited is a residential project. LEED Green Building Platinum Certified. The size of the Apartment ranges in between 618.0 sq.ft. 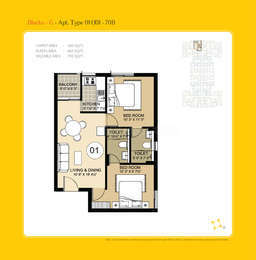 and 1320.0 sq.ft. Lancor Lumina price ranges from 22.24 Lacs to 47.52 Lacs. Lancor Lumina offers facilities such as Gymnasium and Lift. This is a RERA registered project with registration number TN/01/BUILDING/0281/2018. Bank loan approved from HDFC home loans, ICICI, State Bank of India, Indian Overseas Bank, Corporation Bank, Citi Bank, Punjab National Bank, ING Vysya Bank Ltd., AXIS Bank LTD., LIC Housing Finance Ltd. and Sundaram BNP Paribas Home Finance. The project is spread over a total area of 8.13 acres of land. Lancor Lumina has a total of 9 towers. The construction is of 7 floors. An accommodation of 728 units has been provided. Lancor Lumina brochure is also available for easy reference. In which area is Lancor Lumina located?The project is situated in Guduvancheri, Chennai South. What size of flats are available in Lancor Lumina? The apartment sizes in the project vary from 618.0 sqft to 1320.0 sqft. 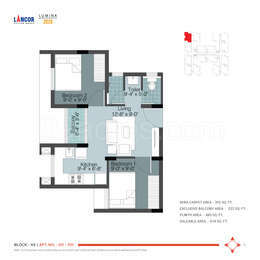 How much is area of 2bhk in Lancor Lumina? Two-room units (2BHK) in the project are available in an area of 618.0 sqft to 1033.0 sqft. What is the total area of Lancor Lumina?The project spans across 8.13 Acres. 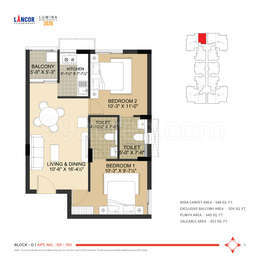 What is price of 2 bhk in Lancor Lumina? 2 BHK apartments in the project are available at a price of Rs. 3556800. L - CREDAI Real Estate Awards 2010; "Best Gated Community Project - 2017" for Lancor Lumina - TOI and the LEED platinum rating from the United States Green Building Council for Menon Eternity an IT Park in the heart of the city.